Government and non-profit institutes are working with corporate America to figure out how drones can ease air and land traffic management issues. The interest is spurred by collaborative investments, contests and grant awards, all with increased efficiency and sustainability as end goals. Public safety concerns and smart city planning are in a not-so-secret handshake these days. Some of the monies have begun to roll to specific projects that are looking for solutions to be implemented in less than five years, especially keeping the traffic spotlight on drone package delivery, driver-less cars, and soon flying cars in the commercial matrix. The new drone air traffic management extends to drones for crime surveillance, as well as emergency response with ground traffic coordination. Ground traffic management alone has presented a challenge, but the marketplace has begun looking at how drones will manage so much more. Even today’s statistics on existing ground traffic give an inkling that management could be better. For example, between 2013 and 2016 there was a 25-percent increase in pedestrians killed in traffic crashes, according to federal statistics. A smart city way is soon going to be the only way as the air space above us and around us takes on efficiencies in communication we have not yet imagined as being critical infrastructure from ground and air activity. 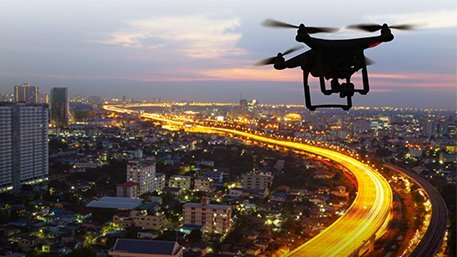 The Federal Aviation Administration (FAA) recently awarded funds to 10 city projects that look at drone innovation, with two having a focus on traffic management in particular. This falls under the FAA Unmanned Aerial System Integration Pilot Program. Other federal agencies are launching related projects to support the smart city traffic flow and make the overall view more accessible for business engagement. Large cities are not waiting for federal dollars to flow their way as they are in action, such as four communities in Georgia with its Georgia Smart Communities Challenge funded by Georgia Power and the Atlanta Regional Commission as well as the Technology Association of Georgia. Big corporate innovators, including Amazon, Boeing, GE and Google, have also banded together and recently announced their efforts at an FAA Symposium for a private unmanned traffic management system for drones to soon begin testing this summer with NASA. The FAA Unmanned Aerial System Integration Pilot Program, now underway, partners federal, state, local and tribal governments to work with private-sector and nonprofit partners to test drones for specific purposes. There are still FAA restrictions, but limits will be tested with traffic management being a priority in two markets in Kansas and Memphis, Tenn. The Kansas Department of Transportation announced last August that it will become the first statewide agency to deploy AirMap’s unmanned traffic management software. And this summer it was named as a funded FAA pilot program project. The department will focus on "precision agriculture" in rural areas, using existing assets such as fiber-optic-based connections and AirMap, according toGovernment Technology News. It will incorporate various technologies, including Automatic Dependent Surveillance-Broadcast, satellite support and geo-fencing. AirMap, with offices in Santa Monica, Calif., and Berlin, Germany, offers the ability to receive notices of flight paths from drone operators and communicate with those operators. That could mean drone capabilities for emergency situations while first responders are on the way, for example. For public safety, it could mean quickly getting an aerial view of traffic conditions. AirMap has raised more than $44 million in funding. Microsoft Ventures, Airbus Ventures and Qualcomm Ventures have a stake in the action. In Memphis, the FAA award under the unmanned Aerial System Pilot Program calls for Memphis-Shelby County Airport Authority alongside FedEx to explore package delivery, aircraft inspections, perimeter surveillance and airport traffic, manned and unmanned. Other government agencies at the federal level are incentivizing change in data sets, by not forgetting privacy. The NIST Unlinkable Data Challenge is focused on proactively protecting individual privacy while allowing for data to be used by researchers for positive purposes and outcomes. The awards in the program are designed to advance data privacy and public safety data. This stage of the Challenge (through July 26th, 2018) seeks conceptual solutions that describe how to use and/or combine methods in differential privacy to mitigate privacy loss when publicly releasing datasets in a variety of industries such as public safety, and law enforcement. The award is $50,000 in funding. The US Department of Transportation’s Solving for Safety Visualization Challenge calls for individuals and teams to compete for $350,000 in cash prizes by developing innovative analytical visualization tools to gain insights or inform decisions to reduce fatalities and serious injuries on the U.S. road and rail systems. The Challenge is in Stage 1 with webinars between now and the first ideation filing deadline coming July 31, 2018. In Georgia, the statewide effort called the Georgia Smart Communities Challenge will give out $50,000 to its key markets to work in collaboration with a Georgia Tech research team to study and develop planning in smart city areas that include traffic management. The cities in Georgia involved are: Albany, Chamblee, Chatham County and Gwinnett County. Active corporate partners are now being sought. Across America, corporate partners are participating in the traffic management equation, including Uber. In fact, Uber and NASA are looking to further pilot and test air traffic management systems. Uber has planned tests around flying taxis by 2020 with plans to launch by 2023, alongside competitor Boeing, and others like Astro Aerospace, which snapped up the assets of Passenger Drone this spring. At stake could be a $74 billion passenger drone marketplace, based on industry projections.